Retaining Rings - Les Joints Étanches R.B. Inc.
WH series is cataloged in the greatest number of standard retaining ring size. WH rings easily handle thrust loads imposed by light or medium series bearings. These rings are covered by military and aerospace specifications and are available in more sizes than any other Smalley series. WHM is designed for the toughest retaining ring jobs., This series can handle double row, tapered roller bearing applications, or other thrust loads which demand deep groove, heavy section capacity. 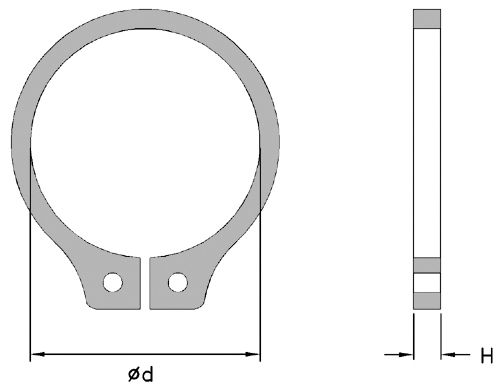 WHM series rings use standard industry groove dimensions. They meet military and aerospace specifications. WHT Many original equipment manufacturers have set groove dimensions specifically for these series. While easier to install, this series has load carrying ratings close to our heavy duty ring designs. WS series is cataloged in the greatest number of standard retaining ring size. WS rings easily handle thrust loads imposed by light or medium series bearings. These rings are covered by military and aerospace specifications and are available in more sizes than any other Smalley series. WSM is designed for the toughest retaining ring jobs., This series can handle double row, tapered roller bearing applications, or other thrust loads which demand deep groove, heavy section capacity. WSM series rings use standard industry groove dimensions. They meet military and aerospace specifications. WST Many original equipment manufacturers have set groove dimensions specifically for these series. While easier to install, this series has load carrying ratings close to our heavy duty ring designs.